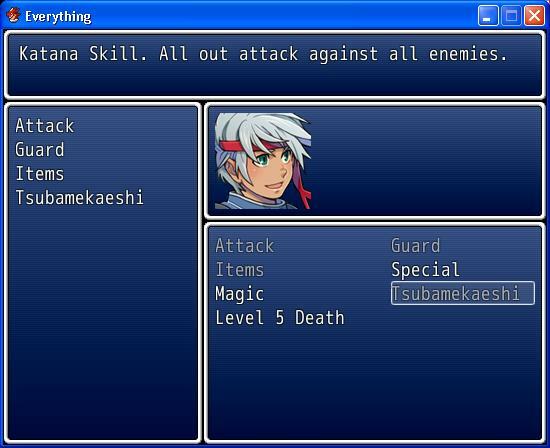 This script allows you to choose which commands are available in battle. You can also tag skills that should be treated as "command skills"; that is, they will be set up as commands rather than skills you choose from a skill list. Set up your skills in the "Battle" menu. to give him 10 command slots by default. To increase or decrease the limit. Man, each time I verify this forum, you have evolved more in coding. Really, I'm amazed how day after day, you're becoming a professional in RGSS. I tried getting rid of YF Equip Engine and it produces the same error with the default equip engine. Well, that kind of makes it a little annoying then. I was hoping to dump all "enable" conditions in that thing. Anyways I've fixed the issue, but now it's less flexible than I would like it to be. You just continue to amaze with these fun scripts. Thanks! Awesome, now that's fixed. What are the appropriate script calls for this? I can't seem to get it to show up in my modified menu. SceneManager.call(Scene_Command_Setup) will open the selection menu. Pageup and pagedown to scroll through actors. your script doesn't include skill cost. excuse me I misunderstood your script but the problem is that whenever a skill is added in the actor command window the skill cost (mp or tp) are not displayed. That's all ; beside it your skill is fully functional. I didn't add it cause the default window doesn't have enough space. Long names already look kind of weird. Is there a way to set which commands an actor has by default? I'm using other scripts of yours that require a Draw skill, which I made a command but when I go into the game I always have to set it up myself through the menu before it's active, which is alright when you've been through the menu a bit and it makes sense but I'm the kind of person who wants the people playing my game not to have so many things put on them to understand at once and without being explained, so I was hoping if there was some way we could set what commands an actor has through a script call or something? Default commands was on the to-do list, but I ended up finding that it was pretty hard to determine how you would actually specify that. Commands can be basically anything: skills, window calls, etc. If everything was based on skill ID's, then I could just use that, but since it's not, it becomes quite a problem. Each actor has a list of commands available. I've hardcoded "attack", "guard", and "item" as the first 3 commands so I know exactly where they are, but the rest can be arbitrary. Are people capable of adding to this list? If so, could you explain what I would put in the sections at the end of the line, as I'm clueless as to what the different "-:---" parts entail. Sorry if I'm bothering you, it's just I've chosen to disable to menu for the first part of my game, when you play a different character other than the main one, but I would like to have a battle that introduces the draw system, yet it's not in the selectable commands yet cause you have to put it there in the in-game menu, hopefully that'll explain the road bump I've hit. the symbol is always :use_skill, and the extra information is the skill ID. An actor's list of starting battle commands is setup through setup_battle_commands. Obviously the code is designed poorly because I'm unable to "find" a particular command without doing a lot of silly things just to get one. but i cant seam to get it to work any suggestions? It shouldn't be anything special. It's just a scene call, which his script should allow you to do fairly easily. I don't know how his script works though. This is without a doubt one of my favorite scripts to add. This is just such a nice game mechanic. It's a good concept, but I don't like the lack of ability to customize it from a designer's POV. 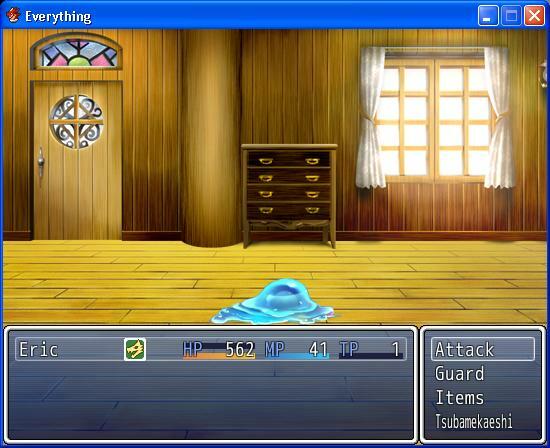 Brazileiro am and decided to use his Three Scripts Modification battle: Units Magic, Magic Draw and Comand Setup. I put the tag in the Notes box, but nothing happens. Could you correct me and tell how to configure the Command Setup? Not supporting this script anymore. Well, it pretty much was not functional since you couldn't customize who started with what. There is also too much hard-coding and awkward things like tagging a skill with skilltype = 1? The only reason the skills were tagged was to be treated as a command, but that really shouldn't matter. I'm going to write a new one in the future using a plugin-based design so that you can register your own commands, so if you're using other people's scripts and want to add it to the command list you can use the note tag system. Yes, that also means creating your own commands. The note-tag system would handle the issue where you couldn't decide who starts with what commands, and also allows integration with other scripts. Script 'Command Setup' line342:NoMethodError occured.